Abstract : The current Report examines the related issues of child labour and youth employment in the context of Malawi. Guided by observed outcomes in terms of schooling, work activities and status in the labour market, the report considers the economic as well as the social determinants of child labour and youth employment. The Malawi National Child Labour Survey conducted in 2015 (NCLS2015) is the primary data source for the report. Data from this survey permit a comprehensive and nationally-representative picture of the child labour and youth employment situations. 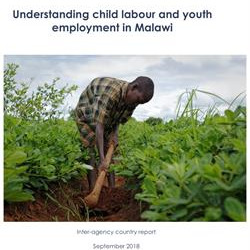 The Report was developed in collaboration with the Ministry of Labour, Youth, Sports and Manpower Development, the National Statistical Office of Malawi and with the UCW partner agencies (ILO, UNICEF and the World Bank). As such, it provides an important common basis for action in addressing child labour and the youth decent work deficit.